Angelenos can still sign up this week as volunteers to help with this year’s Los Angeles area homeless count, which is scheduled for the evenings of Jan. 26, 27 and 28, organizers said. Los Angeles Homeless Services Authority spokeswoman Naomi Goldman urged interested volunteers to register sooner rather than later, preferably by this week, at http://www.theycountwillyou.org . 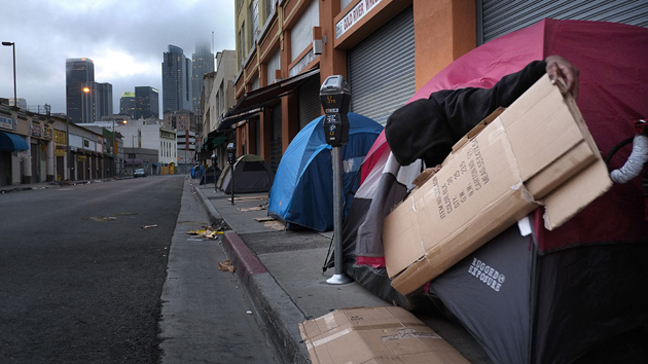 The data gathered in the count “helps us advocate for our fair share of funding to work on this problem in Los Angeles and also helps us and all of our partners allocate the money where it's going to have the most impact,” Goldman said. Past homeless counts have yielded demographics on the number of people who are chronically homeless, victims of domestic violence or sufferers of mental illness; and whether they are single, part of a family or an unaccompanied minor. This year’s count is expected to involve at least 6,000 volunteers —organized into groups — fanning out with the goal of covering as much as 95 percent of the census tracts, according to Goldman. The count covers all of Los Angeles County, with the exception of Long Beach, Glendale and Pasadena, which do their own counts and are under different jurisdictions, Goldman said. The Los Angeles Homeless Services Authority had been doing the count on a biannual basis since 2005. The last count done in 2015 found that there are more 44,000 homeless people in the Los Angeles area — a 12 percent increase from the 2013 figure. This year’s count is being done earlier than usual thanks to funding from the U.S. Department of Veteran Affairs, and marks “the first year of what is hoped to be an annual count,” Goldman said.